We undergo all the procedure for the company incorporation, no matter the company type chosen by you. – Choose the location. One of our advantages is a good collaboration with the local administrations that are open for foreign investors, strongly supporting them. – Search for office areas, production holls, etc. – Office infrastructure services: telecommunications, office equipments, etc. 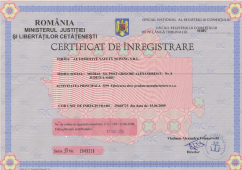 – Registration in various Romanian directories: Yellow Pages, etc. – Various administrative formalities, registration forms, obtaining licenses.